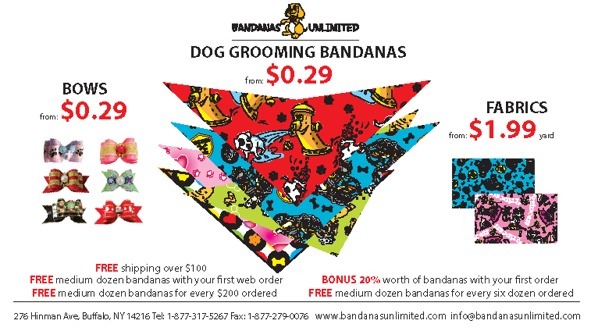 Since 1997 PetGroomer.com has hosted 8one of the most popular Internet marketplaces for used mobile vehicles and mobile businesses for sale. Thousands view this used mobile web page every week. It's the place to buy and sell your used mobile. We also have sources for new mobile units too. Your mobile ad here costs as little as $18 total for 3 months. Cheap and effective! Submit your ad. If you like the original website you are viewing now, that's fine. Many viewers with mobile devices prefer the new mobile friendly version. It's your choice. Remember, same ad listings are at both sites. You always have a choice: www.petgroomerads.com or www.groomerads.com home of the new version. Thanks!!! 2016 Ford Dynastar Wag'n Tails Van - Loaded - Used Only 1 Year. Low Miles. Great Shape! SILVER Ford Transit Mobile Grooming Van with ONLY 399 Miles! Price: $25,000 trailer, $35,000 truck or both $55,000. 2006 Ford Econoline Mobile Grooming Van - Great Price! - Must Sell! 2018 ProMaster with Brand New Conversion! Good Looking Shuttle - New Conversion with Warranties! 64K Miles - 1 Year Old Conversion with Upgrades! 2004 Wag'n Tails Ford E350 Mobile Grooming Van - Fully Loaded! 7 x 11 Grooming Space - Only 36K Original Low Miles - Runs Tip-Top! Below are some vehicles sold here. Use this info to get an idea of what has been selling, asking prices, etc. Remember these were asking prices and not necessarily the final selling price which is confidential to the sellers and buyers. 2006 Ford Shuttle. New Interior with Warranties. Only 80K Miles! 2014 Wag'n Tails Pet Pro - Low Miles - Must See! 2000 Ford E350 Mobile Grooming Truck - 146K Miles - Great Starter! 1996 Ford E350 V8 with 110K Miles - New Conversion - Financing Available! 2016 Wag'n Tails Dyna Groom - Like New! 2002 Ford with Only 92K Miles. New Conversion! Financing Available! 2006 Ford with Extra Options - New Conversion - Financing Available! 2008 Hanvey X2 Sprinter with Only 44,000 Miles! 2005 Wag'n Tails Ford Pet Pro Van - Great Condition! 2008 Wag'n Tails Ford Pet Pro Van - Low Miles - Clean! Barely Used 2014 Hanvey Mercedes Sprinter Less Than 10,000 Miles!! 2008 Ford E-450 Wag'n Tails Elite Mobile Grooming Van - Only 45K Miles! 2006 New Conversion 8/2014 - Pre-Conversion Sale! Reserve it Now! 2005 Ford E-350 Mobile Van - Must Sell! 1993 GMC 3500 Mobile Grooming Van Priced to Go Fast! 2009 Wag'n Tails Pet Pro Van Priced for Quick Sale! New Dodge Conversion Only 66K Miles! 2005 Wag'n Tails Pet Pro Van - Low Miles! Excellent Condition! SOLD 2003 Ford E350 Mobile Grooming Van - Must Sell! SOLD 2004 Ford "Pet Stylist Elite"
SOLD 2006 Mercedes Sprinter - Reduced! SOLD 2003 Wag'n Tails Pet Pro Van Priced to Sell! SOLD 2003 Dodge Wag'n Tails - Need to Sell! SOLD Mobile Grooming Trailer - Must Sell! SOLD Start Your Mobile Grooming Business for Only $5,800! SOLD 1996 Ford E350 Mobile Grooming Van - a Steal! SOLD 2001 E-450 MUST SEE! Take a Look! Built On New Ford Transit Chassis and Shipping Immediately To Pet Groomers Everywhere! 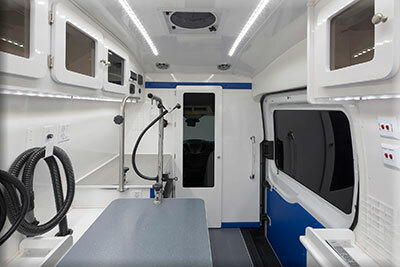 The Dyna Groom van fills an important space in the Wag’n Tails van offerings, between the smaller Ultra Groom van and the diesel powered Endurance Sprinter models. The Dyna Groom Van is spacious with 6’ 6” of headroom, nearly vertical walls and it’s about 2 feet longer than the Pet Pro Van. New features include Cree LED lighting technology to virtually eliminate shadowing, fully enclosed cabinetry, an available 2nd grooming station and all the other amenities groomers love and have come to expect in their Wag’n Tails vans like refrigerators, Clipper Vacs, battery inverter systems, stereos and much more. With over 40 years experience-experience that included operating our own 22 unit fleet of vans-we have the expertise to lead you on a path to success. We are changing lives one groomer at a time every single day here at Wag’n Tails! Our proven business model is continuously being refined and updated to ensure your viability in the mobile grooming market place. 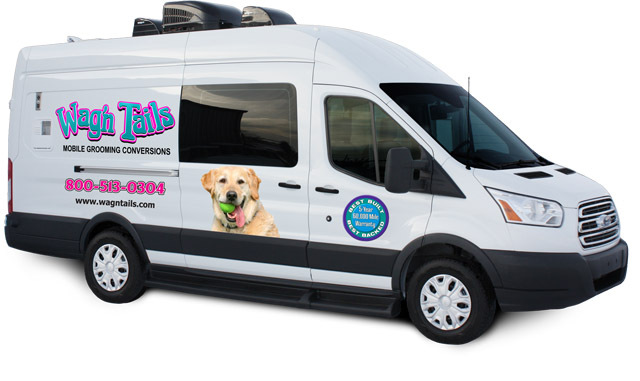 Wag’n Tails provides you with the tools to implement the business model before you take delivery of your van or trailer to jump start your mobile grooming business. We even offer financing of the vehicle and the conversion in one package so no payment is due until after you take delivery of your van. In most cases, you have 30 days to generate income before your first payment is due! We even have a secure online application on our home page at www.wagntails.com to make applying for a loan a snap. Ask any of our over 2,000 groomers living the mobile lifestyle about us. They’ll tell you to go with the best-go with Wag’n Tails Mobile Conversions. We put your dreams in motion! For immediate information, go to Wag'n Tails website, www.wagntails.com and take a virtual tour of our models online and watch our video! Call 800-513-0304. Aussie Pet Mobile is looking for you. Are you looking for individuals wishing to have a career in mobile pet grooming? All levels of experience may apply, additional training available. Please click here and complete the form provided and your inquiry will be sent to an Aussie Pet Mobile near you. 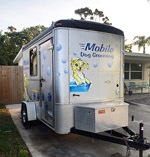 Aussie Pet Mobile is looking for individuals wishing to have a career and ownership in a mobile pet grooming franchise. Aussie Pet Mobile offers a great opportunity for Entrepreneurs in the USA. We have many excellent locations available. No experience in Pet Care or Pet Grooming is required to own your own franchise. Our franchise is not just for pet lovers, it's also for those who are passionate about business success stories. We believe anyone who is prepared to follow a smart, clear and proven system can achieve great success in this business. Stylist Wear for Professional Pet Groomers. Retro Stylist Wear designs stylist wear made of durable, high quality, breathable, nylon material. Only quality, well sewn zippers are used. These pet grooming smocks wash and wear very well daily without ironing. ● Designed with 3/4 sleeves to protect arms from hair splinters. ● Hidden Pockets with quality zippers to avoid the fur-fill-up and furry feet. ● High quality yet breathable nylon material that sloughs off fur extremely well. ● Designed with function and fashion for men and women. ● Longer length keeps legs fur free all day long. ● Great customer service and return policy. ● Our stylist wear is designed, worn, and tested by Bow Wow Beauty Shoppe in San Diego, CA. 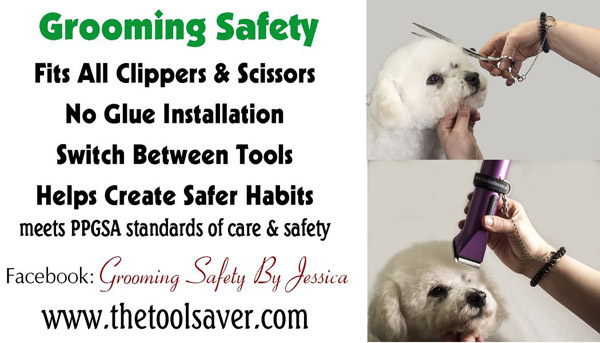 Grooming Safety by Jessica’s company mission is to help create a safer grooming environment in any type of pet grooming establishment, and to promote safer handling practices resulting in a more positive pet grooming experience for stylists, pets, and their people. 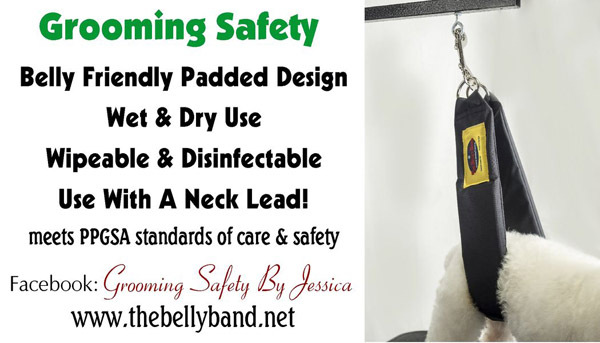 Find these great safety products and more at www.groomingsafetybyjessica.com. In 1975 Mobile Grooming was in its infancy. About the only way to “Go Mobile” was to design and build a unit yourself. That’s exactly what we did and we’ve been building them every since! With over 35 years of mobile grooming experience our founders are true pioneers in the mobile pet grooming industry. Over the years we have watched as this segment of Pet Grooming has grown extremely popular. The basic mobile shops of yester-year have been replaced with a trend toward fancy and exorbitantly expensive mobile salons. Our economy-minded philosophy has always been to keep your overhead low so that more profits belong to the business owner. There should be no need to spend ten upon tens of thousands of dollars to have a modern, efficient, comfortable and classy looking unit. The Better Business Bureau sites one reason for early business failure as “high debt”. So to accelerate your chances for success you should strive to own a low cost, efficient trailer such as ours to meet this sensible goal. It’s fully equipped, compact and lightweight with plenty of top quality components. Please take a few minutes to research what we have to offer and then contact us and let us help make your dreams a reality for less cost than you thought possible. Click here to visit our web site. and other pet related businesses. 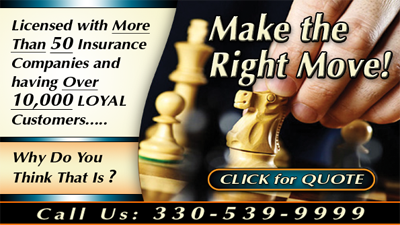 The Governor Insurance Agency, established in 1947, is an independent agency that works for you. With access to over 50 different Insurance Companies, we work hard to locate and customize coverage for your specific insurance needs. Governor Insurance has been doing business in the Mahoning Valley and Shenango Valley (including Trumbull County, Mahoning County, Mercer County and Columbiana County) and surrounding areas, in addition to all 48 states since 1947. Please visit our website for more information or call 330-539-9999 today. Own a BRAND NEW GROOMING CONVERSION and spend $$THOUSANDS$ less than buying a used unit! 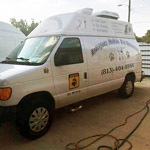 GoMobile Conversions transforms well maintained, low mileage vehicles into money-making grooming salons! Our unique process allows groomers to keep more money in their pockets right from the start while having a great business asset for many, many years. Check out our currently completed inventory. Each unit is unique. We do not believe in a “one size fits all” grooming van. If you have your eye on a unit but want something additional, we can add extra features to units that are already converted. We are able to completely customize your unit to match your vision. If you have more specific brand, year, size, or mileage requirements, we can usually find the right vehicle for you within a week or two. Or if you have your own vehicle, we can convert it into your dream spa. Call us with your ideas and needs. We can help make them a reality. Take a look at our website to see current inventory, options, our process, and more. Let GoMobile Conversions put your dreams in motion. The Pet Industry is Booming and Puparazzi Provides a Great Opportunity for You. Owning a franchise allows you to go into business for yourself, but not by yourself. Puparazzi offers a franchise opportunity that provides an established service backed by a fantastic brand. Our business model includes tested operational systems and a highly effective mentor program that focuses on your growth. The Puparazzi franchise offers an excellent opportunity to help you achieve your goals and become part of a the multi-billion dollar pet care industry, with a franchisor who is there to support and guide you every step of the way. 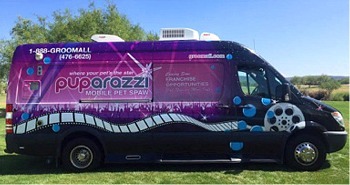 Puparazzi is a mobile grooming business that provides professional pet grooming services to customers at their location. Our professionals take gentle care of our clients’ pets in the safety of their home or office. We understand that your pet is more than just an animal – he’s a member of the family. Knowing that he remains on his own 'turf' or in-home throughout the grooming process gives both of you security and peace of mind. Visit our web site for information. This is where financing meets ambition! It’s not about us. It’s not about our competition. It’s about your wants and needs. It’s about coming Full Circle back to the people who matter the most, our customers! Contact Diana Hodson Wlodarczyk for all of your financing need and questions. Jodi Murphy is recognized as one of our industry's leaders. She is a speaker, contest judge and demonstrator, traveling nationally and internationally sharing her knowledge and skills. 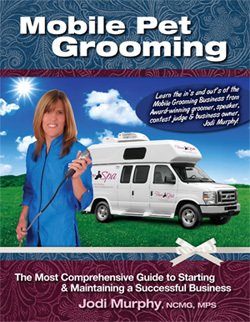 Jodi has given countless seminars on mobile grooming throughout the United States and has now put all her knowledge and experience in this most complete book "Mobile Pet Grooming". This book covers all aspects of starting and maintaining a successful business. Jodi will discuss everything from selecting the right vehicle to sharing tips which will improve your grooming skills. Over the past 15 years, Jodi has started and successfully operated three mobile grooming businesses in three totally different sections of the US - the south, the mid-west and now the northeast. After just a few months of starting up each business, she was unable to take on new clients and has had long waiting lists, thus allowing her to pick and choose her clients. You will "ride along" and learn from her experiences over the years - the good and bad - that have made her into the accomplished groomer she is today. The information contained in this book is priceless. If you are mobile, thinking of going mobile, or even a shop owner, this is the book for you. Don't go mobile without it! 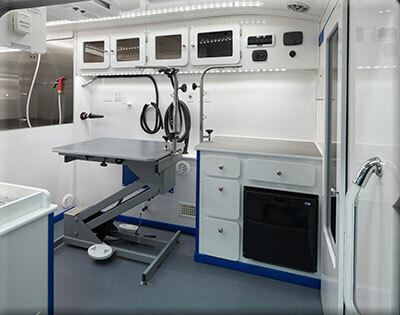 Grooming cats in a mobile unit by Danelle German, CFMG, CFCG and much more! See www.jodimurphy.net. Jodi Murphy is a Master Pet Stylist and National Grooming Consultant for the Andis Clipper company. She is a multiple Best In Show and Best All Around competitor and past member of Groom Team USA for four years finishing in the top four placements on the team. Jodi was an International medalist winning a gold and bronze medal in Barcelona, Spain in 2004 and a gold medal in Milan, Italy in 2007 competing among 13 countries of world renown groomers. In 2005 and 2006 she was awarded Best American Groomer. Even more impressive Jodi has been a successful mobile groomer since 1997. She has bought and sold multiple vans over the years and established 3 businesses in 3 completely differently areas of the United States. With her success she quickly became a well-known and respected speaker in the pet grooming industry and her Mobile Grooming Success seminars have been presented all over the country. Now you can own on 2 DVD's all of the same valuable information from her Mobile Grooming Success seminars. Mobile Grooming Part I covers the business end and Mobile Grooming Part II covers a day in the spa. To learn more about this extraordinary opportunity click here. Our fully-equipped trailers are exactly that: Complete Groom Shops. We don't use "Base Prices" and then charge you thou$and$ extra for air conditioning, heat, generator boxes etc. We offer 2018 models: 6 X 10 at $15,999 and $17,999 for 6 X 12. We also offer The Pod Grooming Salon from UGroom Trailers. We are a distributor of The Pod. The latest thing in Mobile Grooming! Fully equipped at $13,999. Visit our website or call us for more information, pictures or to order yours today! www.gryphontrailers.com or 203-885-5594. Air Oasis Groomer Air Purifiers are scientifically proven to eliminate 99% of bacteria, viruses, mold, fungi, airborne allergens, animal and chemical odors and more. Air Oasis air purifiers can help prevent the spread of infectious canine and feline diseases such as canine cough and can even help infected dogs and cats recover. One veterinarian found that when she placed infected dogs in an isolation room with the Air Oasis air purifier, all the dogs were healthier within 24 hours. What a wonderful feeling to know the air and surfaces in your business are crystal clean and clear for your precious clients and employees. We carry air purifiers for any size facility, including a portable model for your mobile grooming business. Buy one, save 15%, buy two or more, save 20 to 25% (depending on model). • Stops the spread of canine cough. • Aids in prevention of respiratory infections. • Helps infected dogs and cats recover. • Proven to remove up to 99% of aeroallergens, mold, bacteria, viruses, E. Coli, H1N1, legionella and more. • Significantly reduces cage and animal odors. • Lightweight, long life, low maintenance. • Your business can be germ-free. What model do you need? Call 866-875-4386. Starting a mobile grooming business typically involves less cash outlay than a commercial location. Most of the cash outlay is required for the down payment on the mobile vehicle, but you need to have some cash reserves while you grow the business adequate to cover your expenses, and start-up expenses. You do need to investigate licenses carefully. Sometimes you need to get local approval from each city, town or county you groom in the form of a license or permit. Also, some housing associations may prohibit storing your vehicle in the driveway of your neighborhood. Often these associations consider commercial vehicles, especially those with custom lettering, to be an unsightly disturbance to the other members of the neighborhood association. Do your homework for your business! You may be obligating yourself to a significant loan financing your purchase of a new or used vehicle. Protect your investment and ensure you clearly understand what your business needs to earn to cover its operating expenses, and the amount of net operating income (prior your salary or draw) it needs to earn in order to provide you with a personal income from the business income. The old saying, "It's not what you make, but what you keep" that clearly describes your goal in preparing a sales forecast and income and expense projection. Some banks and auto financing firms absolutely require a business plan before they make a loan. It's no small task but perhaps the most important task to protect your investment in your business. You will need to project your business sales income for 3 to 5 years in advance from the day you open for business (see graph above). Then you will need to project the operating expenses and deduct them from your projected sales income thereby giving you an estimate of what personal income you can expect to earn from your business (see graph below). Going into business in the dark without knowing what you can expect to earn in sales and personal income is an unacceptable risks to banks or investors, and for good reason. Chart generated by Pet Grooming Business Plan Helper & Sampler, a Grooming Business in a Box® product. The chart above shows some retail sales income. There are mobile groomers that sell flea and tick treatments, brushes, combs, toys and treats. Holistic food is also growing in popularity. Many pet owners desire the savings of buying the bulk bags but have little or no means of carrying the bag; the mobile groomer can. a Grooming Business in a Box® product. How much do you need to invest? That's another question that must be answered with financial planning. 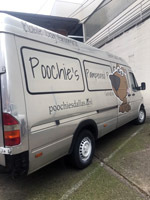 Fortunately mobile grooming businesses are known for reasonable start-up costs involving cash outlay compared to a commercial locations. You don't have to deal with leasehold improvements like flooring, tiling, plumbing, carpentry and electricity. In some commercial locations leasehold improvements can cost as much or more than the cost of a new van or trailer. The graph below shows the start-up funding required for a mobile business purchasing a new van. The business could be new or turning in an old van for a new one. The mobile owner requires about $58,000 in "start-up assets" and $3,000 for start-up expenses. Every business owner learns basic financial terms and you definitely need to know the difference between an "asset" and "expense." In accounting and tax reporting your assets and expenses are handled quite differently. Suffice to say that assets for a mobile grooming business is major equipment like the vehicle and its contents. Start-up expenses are easy to understand. They have a short lifetime and include grooming supplies, small tools and equipment, advertising, stationery, licenses, and fees to name just a few. Refer to the chart below once more. We know the groomer requires $61,000 to cover the purchases of assets and expenses, and some of that asset amount should be cash reserved because you run a new a business at a loss for several months until the clientele and demand increases. The chart tells us that the groomer plans to seek a loan (light yellow) of $48,000 and her investment of her own money (light blue) will be $13,000. If you require a bank loan or investor they are going to want to know exactly how much of an investment you need and how much you are personally putting up of your own money. Don't proceed without knowing the numbers, and have them well-documented. You are certain to be asked for that documentation. If you don't have it you will be perceived as being naive about the conduct required to start-up a business. It's okay to be naive now, but start learning more today. There's another very common question someone is likely to ask you. Again, don't venture into business seeking loans or investors without knowing your projected "breakeven point." Below you will find the breakeven table for the groomer opening a home business above. Do you understand the figures? It's not too hard to figure it out once you know your projected average service fee for grooming services you expect in your business, and what your fixed costs are. Fixed costs can include interest payments on your loans to start-up the business, supplies, utilities etc. In the example above the new business owner knows her business requires $2,142 a month to meet its fixed costs of operation. Because she knew her average grooming fee would be $46.37 it was easy to divide that number into the fixed costs of $2,142. The result is 46 services. In other words, the mobile groomer must groom 46 pets a month to meet costs of running the business. In this case, 46 pet services does not include personal income for the mobile owner (unless a small base salary was included in the in the $2,142 amount). Impress others by sharing your break-even point. Now consider this question. Isn't it easy to count the number of pets you groom as you work through a month? Sure. Knowing that you must groom at least 46 pets to meet break-even is an easy way to track your progress at any time during the month. You will be better prepared should you not meet your goal, or to celebrate when you exceed your goal and start boosting your profit. There's no simpler way to write a professional mobile grooming business plan suitable to present to banks than with Pet Grooming Business Plan Helper & Sampler. In fact, one of the sample plans is a mobile groomer start-up plan for Doorstep Mobile Grooming. 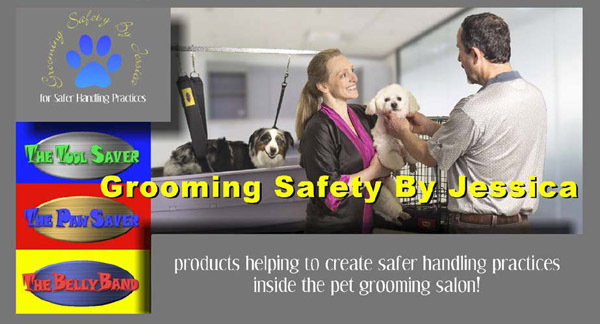 No one else has ever released similar information and tools customized to the needs of pet groomers. Take a look at Grooming Business in a Box®.